Richard Pearsall was born in Dublin; he studied at the Slade School of Fine Art and at the Académie Julien, Paris. He married Phyllis Gross, sister of the artist Anthony Gross and an artist in her own right (she was the founder of the Geographer’s A-Z Map Company). Together they embarked on a nomadic life in Europe, painting together in Spain. 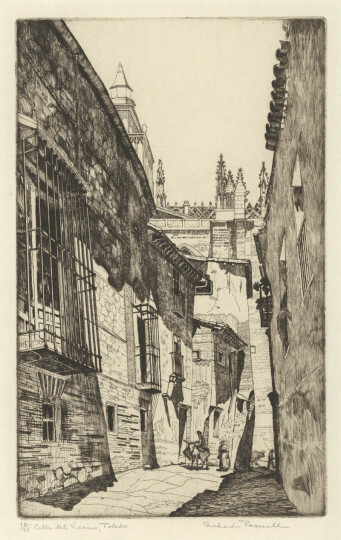 Calle del Vicario, Toledo was exhibited at the Royal Academy in 1934.